As the second biggest city in Croatia, Split has a lot of expectations to fulfil and the most important test for such city to pass is the nightlife offer. With its crowded streets and squares; bars, restaurants and clubs staying busy even in the middle of the work week; Split definitely pleases even the most picky of tourists. The liveliness of the daytime city life truly blossoms by night. Once the sun sets, and the summer swelter becomes a little easier to bear, Split shows its true colors as a genuine tourist destination. After a day of leisure and refreshment at the beach, you should head for the center and let the city alone guide you on your spontaneous stroll down the narrow, stone covered streets. You will find that almost every corner, square or street serves as a stage for countless amusing street performances. As you clear your way through the evening crowd, you will find numerous street stands offering refreshments and various local delicacies. Be sure to take a stroll down the famous Split waterfront, Riva, and enjoy a relaxing walk by the sea. As you make your way through the city center, you will notice countless coffee and cocktail bars, as well as restaurants and nightclubs. Depending on your preferences for the night, you can choose among the more peaceful venues hidden inside the ancient city walls or you can dance the night away in one of clubs along the coast. If you prefer a more intimate atmosphere, we recommend some of the bars scattered across the city center. Enjoy the romantic ambiance of the two most popular wine bars in Split: Paradox and Zinfandel as well as their wide selection of international and local quality wines. If you are planning to continue your night out in one of the dancing clubs, it is best to get in the party mood in one of the numerous city cocktail bars or pubs, such as Gaga, Ghetto or Teak and enjoy masterfully prepared cocktails, enchanting local atmosphere and witty jokes of the friendly staff. While sipping your drink and sitting on the cushions scattered along the monument steps of the ancient Peristyle, you can enjoy live music performances in front of the Luxor bar. Once you are ready for a more lively atmosphere, head towards one of the night clubs and enjoy the dancing rhythms. St-Riva is a cocktail bar and a nightclub in the middle of the city waterfront, Riva. It is incorporated into the southern walls of the ancient Diocletian’s Palace. A little father down the eastern banks of Riva there is F-caffe, a café bar during the day and a popular nightclub after sunset. In the building of the city harbor there is a huge, newly opened venue, Imperium. It is a night club, lounge bar, restaurant and a pastry shop often hosting international DJs and big parties. While you enjoy your time at Imperium, you can admire the magnificent view of Split and the surrounding islands. Perhaps the most popular nightclub among the local youth is O’Hara music club and pub. Famous for its various theme parties, O’Hara has something to offer every day throughout the year. The club is situated in the corner of the Zenta Bay and is divided onto two floors, every hosting its own DJ or live band. Definitely the most luxurious and extravagant nightclub in Split is Hemingway bar situated by the sea, at the northern slopes of the Marjan Hill. It hosts famous Croatian and international performers, and offers a rich selection of party events. 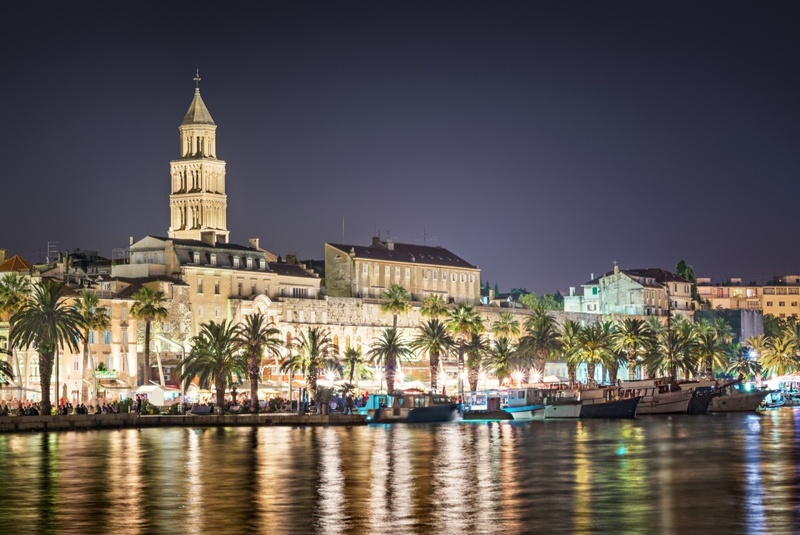 Split has a number of smaller nightclubs and bars, scattered around the wider city area if you are in the mood to explore the urban culture of modern Split. For those interested in local cultural events; Split has a lot to offer, hosting several internationally acclaimed theater, film and music festivals. The central cultural event of the summer is Split Summer Festival, traditionally held every year through July and August. Taking place in numerous open air venues across the city, it offers a rich selection of music, theater, dance and opera performances. A special attraction for tourists as well as locals is a three day celebration, Diocletian’s Nights, held between 20 and 23rd of August on every year. The participants dress up in togas and uniforms and take part in celebrations while enjoying good music, food and drinks in the manner of the Ancient Roman tradition.